We have put together a series of questions we think many parents new to our school would like answered. We would be very grateful if you would email any other questions you think should be included and we can add them in for next year’s parents. What are the school times? We open at 9am and the school day ends at 3:10pm. Morning interval is from 10:40-10:55am and lunch is from 12:15-1:10pm. The children have 5 hours teaching each day. What do I do if my child is unable to attend school? You should contact the Pupil Absence Reporting Line as soon as possible (0141 287 0039) and say why your child will be absent and how long the absence will last. You should also call this number if your child has an appointment and will require to take time out of school. Children should not be kept off unless it is essential. One of our Depute Heads monitors attendance and we aim to have an average attendance of +95%. If your child has an unexplained absence our school office will text you. That is one of the reasons we need you to ensure your contact numbers are up to date. If the text does not yield a response we will ask our attendance officer to visit. These procedures form part of our Duty of Care responsibilities. Sometimes parents need to request leave of absence for their child. This should be done by writing to or emailing the Head Teacher. If the request is granted a form, obtained from the school office, should be completed. If the absence is scheduled to be over 2 months then we may have to remove the child from the register. How does the Dinner Hall work? Children can either pay for their lunch, currently £1.90; or they may be entitled to a free meal if a parent is eligible and applies; or can bring a packed lunch. The P1 children always come along to the dinner hall first and a weekly rota operates for the other children. Cordia are the arm’s length Council Service responsible for operating the Dinner Hall and the Breakfast Club. Menus, based on a week one and week two structure, are distributed on a regular basis. All food served in the Dinner Hall is compliant with the guidelines from the Scottish Government in their “Hungry for Success” policy. A vegetarian option and a halal menu are always available. Any child with a medical diet can be accommodated. Parents are asked to ensure that children are not given nuts or nut products for their lunch or snack. We have introduced a cashless system in the dinner hall. This means that parents can pre load a swipe card either on the internet or by coming into the school (just outside the dinner hall) and putting money in to a machine. This has several advantages: Firstly is should reduce waiting times as there are no cash transactions. Secondly it anonymises who pays for lunch and who is entitled to a free meal. Thirdly, it enables parents to check that their child is actually purchasing a meal. 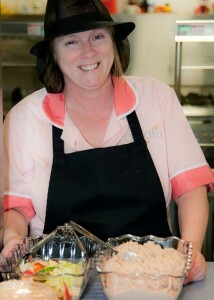 We have a number of staff present in the Dinner Hall and they check that children are eating. If you are concerned that your child is not eating his/her lunch let his/her class teacher know and the Department Head will arrange for the situation to be monitored. All P1 children eat their packed lunch in the dinner hall. There is the facility for children who bring in a packed lunch to eat it in the Dinner Hall. Some parents or younger children prefer this. Some parents like the idea of their child sitting outside eating their packed lunch with friends. We have picnic tables in the play areas and they are supervised by Pupil Support Assistants in the infant areas. All classes have a designated class teacher. There may on occasion be two teachers when a job share arrangement is in place. In addition to the class teacher at least one and more likely two other teachers will be responsible for some aspects of the curriculum during the week. This is because class teachers have a contractual agreement that means the maximum they can teach in any one week is 22.5 hours. If there is more than one class in each stage then the teachers may organise the teaching groups across the stage and so your child could have a different teacher, other then his/her class teacher, for maths as an example. We also have English as an Additional Language Teachers and a Support for Learning Teacher who work throughout the school. On occasion the Department Head will time table herself into a class to support learning. Finally we have infant and upper school assemblies every week. The Department Heads and Head Teacher take assemblies. What are Assemblies and when are they held? Assemblies take place every Friday with P1, P2 and P3 going to the gym and P4 -P7 going to the Dinner Hall. Each class prepares a presentation on a rotational basis; we sing songs, discuss school rules, celebrate achievements and promote our school ethos and values. PSAs stands for Pupil Support Assistants. We have a number of PSAs and PSA ASN (Additional Support Needs) in our school. These are skilled individuals who work under the direction of the class teacher to support learning in the class. They also supervise the children in the playground, accompany children on trips and help with resources and display work. What happens in the playground? We have a number of play spaces. The Piazza, beside the dinner hall at the Gibson Street end of the school, is for our P1 children. The courtyard, the space at the bottom of the stairs down from the main entrance, is for our P2 and P3 children (and out P1s at morning interval). The Grove, the area incorporating the grassy areas at the rear of the school, is the designated area for our P4 – P7 pupils. The play areas are separated out for safety reasons and to give the children space to play. Each play area is supervised by a number of Pupil Support Assistants, the janitor and, in the case of the infant playground, Buddies. Buddies are P7 children who have been trained to play with, support and help our infant children in the playground. They work very well with our younger children and help promote a sense of community. A number of games and activities are being introduced into the play areas in the next period of time. We also have a football pitch. It is situated in the park and is about a ten minute walk away. We have started using it a couple of times a week but so far it is only for our oldest children to use during lunch times when a number of adults/parents accompany the children. What is a wet interval? We aim to ensure that our children can go out to their play areas as much as possible at break times and children should come to school dressed appropriately for the weather. However if it is very wet or exceptionally cold then we would keep the children in. That is a wet interval. 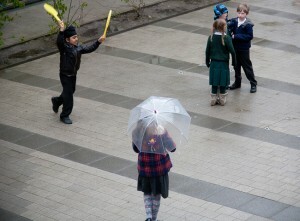 The children will remain in their class and their teachers arrange for them to choose from a range of activities. PSAs, Buddies and members of the management team supervise the children. Parents complete a medical consent form when their child is enrolled and the office keeps a note of all of the medical conditions made known to us. Parents of children who require to use an inhaler should ensure that they have a spare one in school. These will normally be labelled and stored in the school office available for use by the child as required. We should be informed of any changes in medical conditions immediately. If a parent requires a child to take medicine during the school day the medicine should be handed into the school office with a note clearly explaining what is required. Please note that there is no School Nurse on site. Who deals with First Aid? If a child sustains a minor injury in school then it will be treated by our support staff. If a child has a head bump then the parent will be informed either by a phone call or a note. If a child has a serious injury or is unwell then the parent will be contacted and the situation discussed. If it is a very serious injury the school office would contact the parent. If we were unable to make contact with a parent or if the child needed immediate medical care we would arrange for the child to be taken to hospital. It is absolutely vital that we have accurate emergency contact details for all of our parents. We have clear procedures if a child soils himself/herself at school. This involves contacting and informing the parent that the child has had an accident and needs to be changed. The school would not change a child (unless in exceptional circumstances) for reasons of cross contamination, personal dignity of the child and possible child protection considerations. We would move the child to a toilet for the disabled and provide wipes and a change of clothing. Again this highlights the need for up to date emergency contact details. What is the policy on Homework? 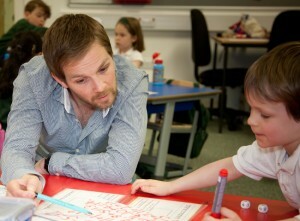 Homework provides an important link between the school and the home. We acknowledge that parents and children lead busy lives and we try, for our older pupils in particular, to hand out homework at the beginning of the week and collect it back in at the end of the week. This enables families to plan when homework can be done so that it does not interfere with other arrangements. Homework consists of reading practice, spelling/phonics practice, maths, topic work and individual projects. The length of time to complete tasks varies but as a general rule infant homework takes about 10 minutes per session and older children would expect to spend 20-30 minutes on their homework. We hold two parents’ evenings per session (usually October and March) and produce an annual report (send out at the beginning of June). For many parents that, plus the information gained from working with their child on homework, provides sufficient information and reassurance on their child’s progress. However if you have any concerns or require any further information you can either request a meeting with your child’s class teacher or you can contact the Department Head and arrange a meeting. They are happy to meet with you at any time. If you wish to make a complaint, please contact the Department Head through the school office on 0141 339 1365. We will try and resolve any complaint fairly and effectively. If you remain dissatisfied you can complain directly to Glasgow City Council, Education Services who have a Customer Liaison Unit. We would hope that all issues can be resolved at a local level and work hard to ensure this is the case. Do Pupils have a voice? Yes they do! 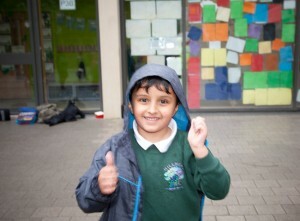 We actively encourage pupil participation in our school. We have a Pupil Council, Fair Trade Committee and an Eco Committee. Children are elected to these committees. We also have our Junior Road Safety Officers and are developing Eco responsibilities for all of our upper school stages. In addition we have an open mike session at every upper school Assembly where pupils can raise issues or make suggestions. Do Parents have a Voice? Is there After Care / Out of School Provision? There are two, privately run Out of School clubs. Karemore (07887683534) is based in our school. Safe till Six (0141 331 7669) collect the children from Hillhead Primary School and take them to Maryhill Burgh Halls. We store lost property in the wet class room area on the riverside of the school. We would ask all parents to help reduce the amount of lost property by ensuring that their child’s clothing and property has his/ her name on it. Children should not bring valuable items to school. Each class has two hours of Physical Education every week. There is a time table drawn up to accommodate all classes. Our policy is that children should bring their PE Kit in on a Monday and take it home for washing on a Friday. That way they will always have their PE kit. The PE kit is a T shirt or long sleeved top, shorts or joggy bottoms and sand shoes or trainers. There are changing rooms near the gym and each child has a coat hook and shoe box outside their class from where their PE kit can be stored. For Health and Safety reasons all jewellery must be removed. If you are going to let your child have his/her ears pierced please arrange to do this at the start of the summer holidays as they have to be kept in for six weeks. Swimming lessons are provided for our P7 children. When appropriate PE will be taken outdoors.